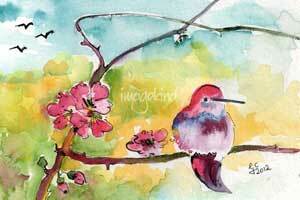 Hummingbird Art is extremely popular today. Historically, these birds have captured the imagination of artists of every genre. Native American and South American Indians believed in the strong symbolism of the amazing bird. They decorated themselves ceremoniously with images of the hummingbird. They told stories and sang songs about them. The Pilgrims wore hummingbird earrings when they first visited the Indians. 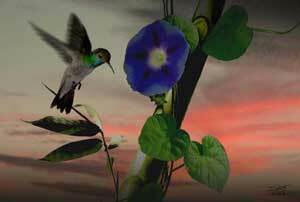 There is evidence of a vast supply of art forms with the hummingbird theme from the past centuries. 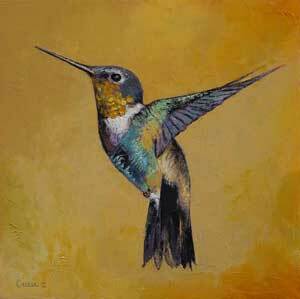 Today, hummingbirds are more popular in art than ever before. The inspiration of the tiny creature with iridescent feathers is revealed though every artistic outlet available. 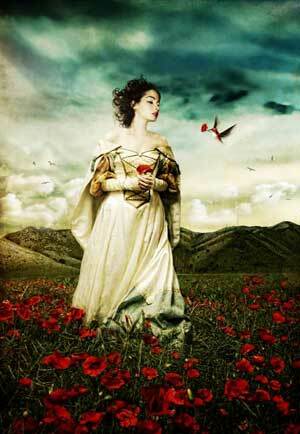 There are original paintings by Frieda Kahlo and many other famous artists. This original art is available in the more affordable form of posters. 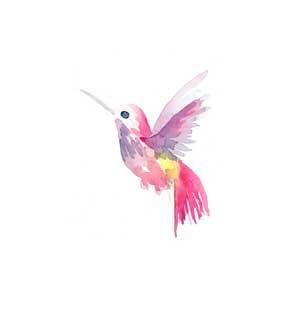 Hummingbirds are always a good idea. A bird that is classic and timeless. I love capturing their beautiful movements with my favorite medium, oil paint. 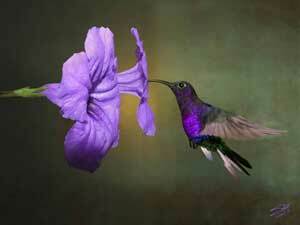 Hummingbirds are a symbol for accomplishing that which seems impossible. They teach us to find the miracle of joyful living from our own circumstances. They are seemingly tireless. Always seeking the sweetest nectar. They remind us to forever seek out the good in life and beauty in each day. I was inspired to paint a beautiful ruby red throat with a masculine feel. The grey background really gives this guy a pop. He is delicate yet strong giving the perfect balance for this piece. My Hummingbirds are dreamt in my mind and are all unique in their own ways. I never get tired of the painting their beauty and movement. 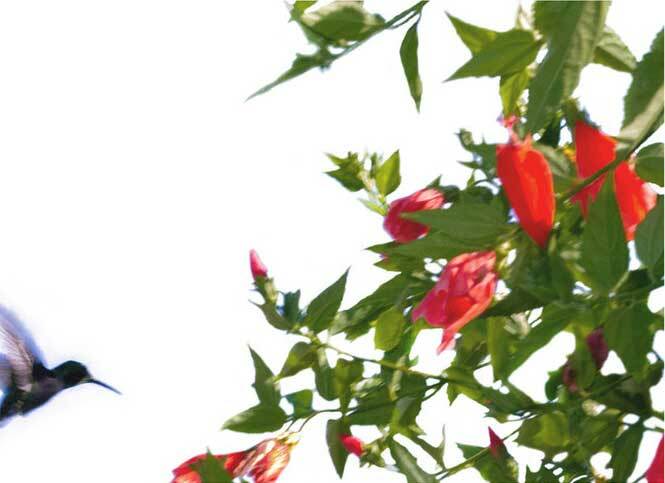 A hummingbird revolves around scarlet red flowers of a curious name, Sleeping Hibiscus, because its flowers do not open fully. 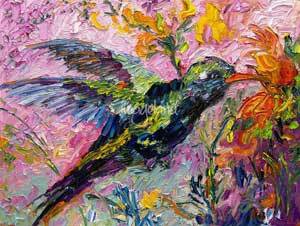 Flowers and leaves point to different directions giving movement to this composition that is vibrant for its colors and delicate by the graciousness of this little bird. I have been painting all my life. I began painting birds in flight to loosen my brush stokes and let myself be a little more careless and flowing in my paintings. I fell in love, especially with hummingbirds. Not only for their beauty, but for their meaning. 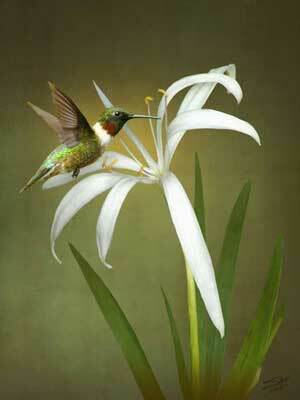 What the hummingbird symbolizes is what really draws me to them. 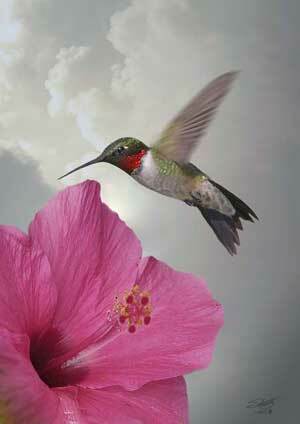 Hummingbirds are a symbol for accomplishing that which seems impossible. 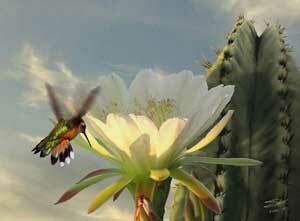 They are seemingly tireless, always seeking the sweetest nectar. They remind us to always seek out the good in life and beauty in each day. They teach us how to find the miracle of joyful living from our own circumstances. 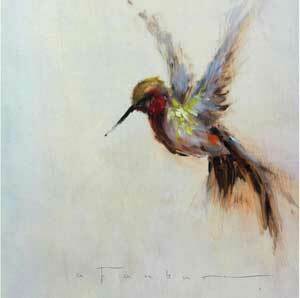 I have sold over 85 original paintings of hummingbirds. This print is from one of my favorite collections. I feel that everyday life can easily become a cluttered hectic mess; photography is my escape from that. I love isolating a small bit of beauty to compose minimalistic scenes and incorporating a nostalgic, vintage feel. 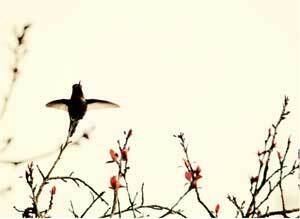 I usually display this photo as part of a trio of hummingbirds all in the same setting for a cohesive look. Birds have caught my interest since I was a little girl. Their diversity are limitless. There are hundreds of different types of bird species in this world. Fact that birds are the last surviving lineage of dinosaurs make them more appealing to me. That's what inspired me to create a series of bird illustrations. 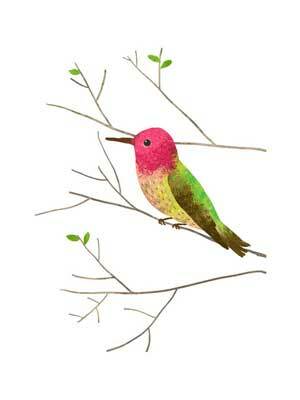 This Anna's Hummingbird is one of my bird illustrations collection. My Illustrator bird series stemmed from a college graphic design course. This bird can stand on its own or be paired with my other illustration. Freedom of expression is key in my illustrations as each bird portrays a unique personality, style, and dimension. Depth, dimension, and color are also important in my designs. This watercolor painting of a hummingbird captures that moment, the one where this amazing bird hovers right outside your kitchen window, gives you a moment to stare in wonder, then quickly turns and drinks from your bee balm blooms. The style is loose and alive with movement. 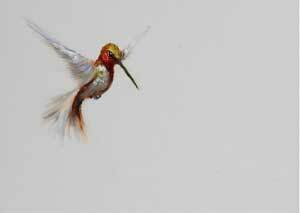 Hummingbird Art has been taken to creative levels. Hummingbirds have been subjects of many drawings. The Audubon Society was named after the nature artist James Audubon, because of his highly detailed drawings of birds, including some of hummingbirds. 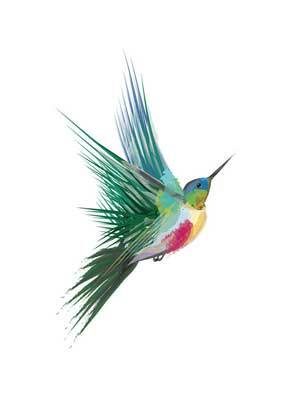 Another artist that comes to mind is John Gould who is famous for his highly decorative monographs of hummingbirds. Hummingbird gifts are welcomed for all occasions. 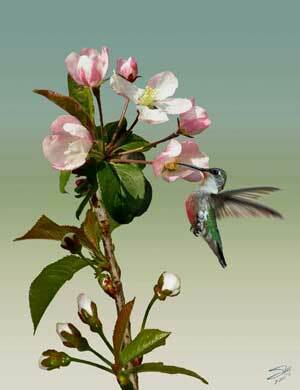 There are hummingbird sculptors, woodcarvings and prints. Hummingbirds are commonly used in the popular folk art. 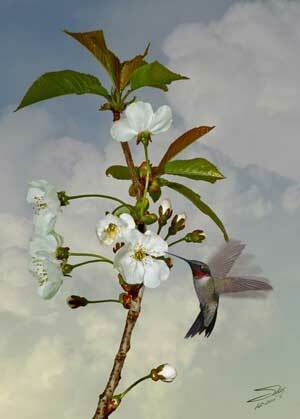 Musicians write hummingbird lyrics and perform songs inspired by the tiny energetic creature. Hummingbird Tattoos are common these days and make the most endearing body art. 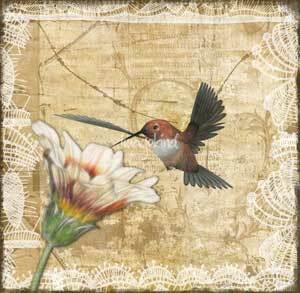 Commercial artists use hummingbird designs for clipart. Clipart is used everywhere from classrooms, home crafts, or businesses. 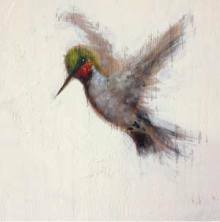 Modern culture has a prolific amount of hummingbird art extracted from the past and continually giving birth to new themes and forms of art today.